At Rice University in Houston, Texas on 12 September 1962, John F Kennedy stood in front of the assembled audience and declared that “We choose to go to the Moon”; on Monday 21st of July 1969 at 02:56:15 UTC, Neil Armstrong took “one small step for [a] man, one giant leap for mankind“ off the ladder of the Eagle command module and became the first human in history to set foot on an extra-terrestrial body, namely our Moon. The landing was the culmination of almost a decade of advanced technology, research, engineering and sheer determination to do what many considered to be impossible. It is weird to think that something like a modern iPhone contains way more computing power than all of the computers used in the entire Apollo 11 mission put together, such was the level of technology at the time, and yet they succeeded. Very impressive. Sadly I was too young to know what was going on, let alone to really remember any of it (certainly far too young to have stayed up to watch it!). Indeed, the entire Apollo project was over before I was old enough to be aware of such things, although I do remember avidly watching the Apollo Soyuz link-up which was itself an historic occasion, marking as it did a thawing in USA-USSR relations and their first collaboration in space – strange to think that it could be any different in these days of multi-national teams working together in harmony on the International Space Station. All I can do is look back in awe and amazement, and wonder just what it must have been like to stand outside, look up at the Moon, and realise “Hey, there are two people actually walking around up there!”. I was speaking to my Dad about this earlier this year, and he said that he had done exactly that, standing in the garden just looking at the Moon, trying to take in the fact that at that precise moment there were two human being walking around up there. It must have seemed surreal. What is also sad is that Kennedy, the man who had given the USA the mission to successfully land people on the Moon and return them to Earth before the 1960s were up, was not around to see his project come to fruition. Interestingly, in 1963, Kennedy had proposed to Khrushchev that their countries work together for a join Lunar landing project rather than race each other, thereby combining resources. It seems that after initially rejecting it, in December of 1963, Khrushchev had decided to accept the proposal, in part because of the growing relationship between the two leaders which was forming as a result of their interaction during the 1962 Cuban missile crisis. A joint programme, whilst still a very hard thing for the leaders to sell to their respective countries, could have made the world a very different place leading as it would to closer co-operation between the USA and the USSR. It may even have averted the coup that removed Khrushchev from office in October 1964. Fate intervened, however, just a week later when Kennedy was assassinated. The Russians did not trust the new Johnson-led government, and the plans were quickly abandoned, with history taking the course we know today. Apollo 11 landing site, as Armstrong and Aldrin left it some 45 years ago, LROC M175124932R [NASA/GSFC/Arizona State University]. Click for larger image. After making a last minute emergency manual manoeuvre to avoid a sharp-rimmed ray crater, the Eagle touched down at 00.67408° N latitude, 23.47297° E longitude on Mare Tranquillitatis, or the Sea of Tranquility, on 20th July. 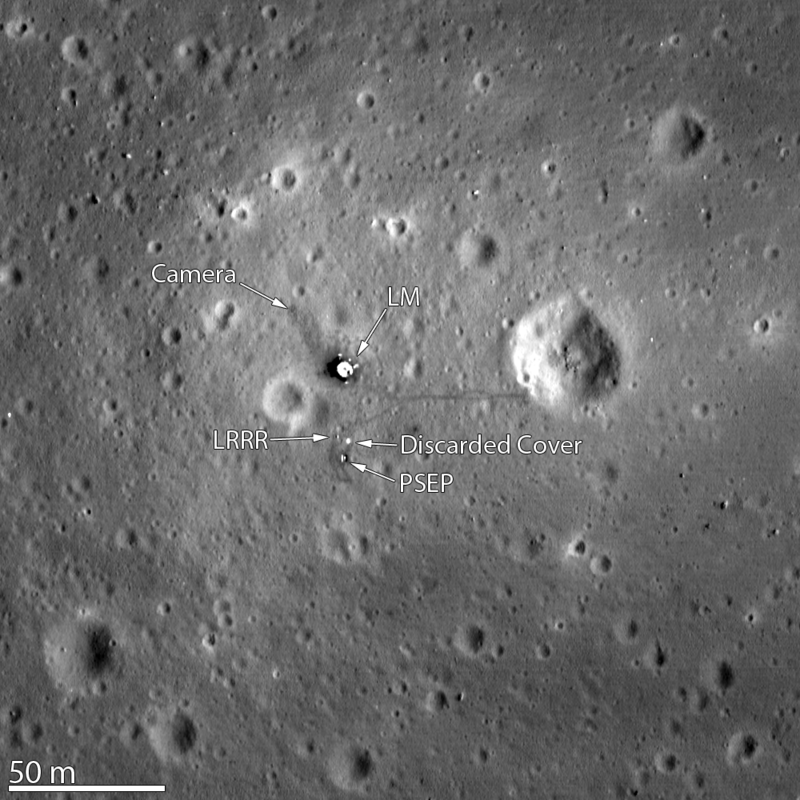 The landing area has been designated Statio Tranquillitatis after Armstrong called it “Tranquility Base” upon their successful landing, and three small craters to the north of the base have been named Aldrin, Collins, and Armstrong in honor of the Apollo 11 crew, as you can see on the lower mid-right of this photographic map. The Lunar Reconnaissance Orbiter has captured the clearest photo yet of the site which you can see on the right. It shows the remains of the Eagle, some of the equipment, and even the outline of the footsteps of Armstrong and Aldrin. You can also explore the Apollo 11 landing site in much greater detail, with a lot of useful explanatory notes, courtesy of NASA. Of course, we can’t think about the greatest achievement in the history of mankind, namely the Moon landing, without remembering briefly that there are those out there who, for nefarious reasons known only to themselves, insist on claiming to believe that the whole thing was faked and that the human race as never landed on the Moon. Mythbusters NASA Moon Landing Special debunks all of those nonsense theories rather comprehensively, as do a very great many other places,not forgetting the fact that we can bounce laser beams back off the reflectors they left on the Moon. Even without all that evidence, just think about the sheer practicalities of managing to have thousands of people keeping the secret for decades (an absolute impossibility as anyone who has ever attempted to organise a secret party involving more than a few helpers will know! ), not to mention the fact that the USSR, bitter rivals in the Space Race, would have easily been able to prove the transmissions were not coming from the Moon and gleefully exposed the hoax to the world at the time. Which they didn’t. Because it wasn’t a hoax. Still, I guess those who choose for whatever reason to believe it was faked are not going to allow a little inconvenience like facts to get in their way. After all, let us not forget that there are actually people on the planet today who swear blind that they believe that the Earth is flat. In all there were 10 planned Apollo Moon landings, taking us all the way to Apollo 20. The unlucky Apollo 13, of course, never got that far after suffering a major disaster with the explosion of the number-2 oxygen tank in the Service Module, leading to the landing being aborted as the teams on Earth and in space worked frantically together to bring the astronauts safely back home, which they did successfully. Later, Apollo 20 (the planned final Moon mission) was cancelled as its rocket was reassigned to the Skylab project, the USA’s first space station which ultimately lead to the International Space Station in orbit today. NASA’s budget was then cut (some things never change) which lead to the cancellation of Apollos 19 and 18, leaving Apollo 17 to be mankind’s final manned mission to the Moon in December of 1972. Since which no human has gone any further than low Earth orbit. Gone are our trips to the Moon. Lost are the various mooted manned missions to Mars, at least for the time being. It’s almost as if after 3 glorious years of manned exploration, the human race has retreated back to its collective cradle. Left to right: Armstrong, Collins, Aldrin. But for now, let’s take a moment to remember when we set foot on the Moon for just over three absolutely amazing years. And remember back to 45 years ago when Commander Neil Armstrong and Lunar Module Pilot Edwin “Buzz” E. Aldrin Jr. set foot on the Moon, whilst Command Module Pilot Michael Collins remained flying in Lunar orbit, ready to bring all three of them safely back home to planet Earth and the rest of humanity. Ever since that day there has been debate over whether or not Armstrong said “a man” or just “man”. It doesn’t really matter, the intention and meaning is abundantly clear. What is for sure though is that he never said “Good luck Mr Gorsky”. OK, technically the Moon may not actually be an extra-terrestrial body as such, but let’s not split hairs here, you know what I mean.